Alvaro Odriozola will become Julen Lopetegui’s first signing at the La Liga club. 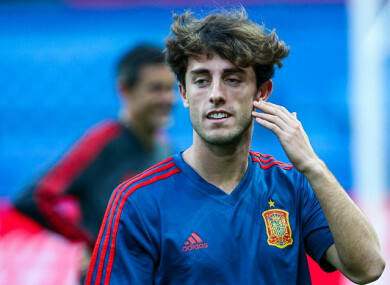 Odriozola didn't make an appearance at the World Cup. His form on either side of defence even led to a surprise World Cup call-up for the full-back from former Roja coach Julen Lopetegui, although successor Fernando Hierro failed to give him a single minute on the field as Spain went out in the last 16. Lopetegui has now made Odriozola his first signing at Madrid, in a deal estimated to be worth the full value of Odriozola’s €40 million release clause. “Real Madrid and Real Sociedad have agreed the transfer of Alvaro Odriozola, pending a medical,” the Merengue confirmed via a statement released on the club’s official website. Odriozola is the first arrival in what promises to be a busy transfer window for Madrid, who were relatively inactive throughout Zinedine Zidane’s two and a half years in the hotseat. Cristiano Ronaldo is close to sealing a move to Juventus, where he will take up the challenge of winning a league title in a third country after succeeding with Manchester United and Madrid. Email “Real Madrid to pay €40 million for highly-rated Spanish full-back ”. Feedback on “Real Madrid to pay €40 million for highly-rated Spanish full-back ”.